We went to the thrift store the other day because I wanted to pick up some cake/dessert plates for this dinner party we were hosting. But thrifting never quite works out that way, does it? 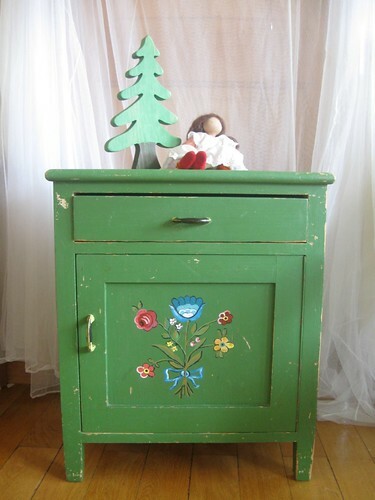 We found the little hand-painted green table above-- exactly the table that Moonshine needed, and green! Her favorite color! 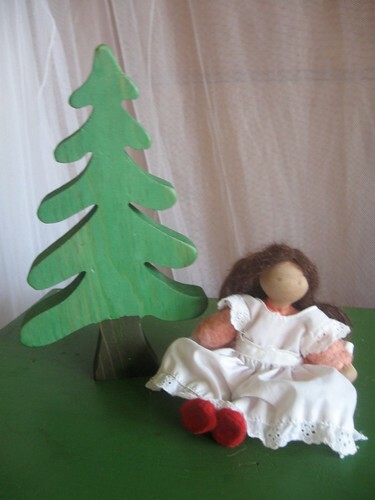 And then Moonshine found this handmade Waldorf bendy-doll and a tree. It's always like this. Whenever we go we always find something too cool to pass up. 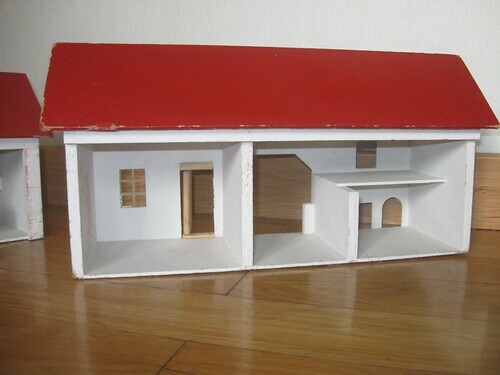 Like that fantastic dollhouse store we rescued a few months back. That's how the kids think of it-- rescuing. 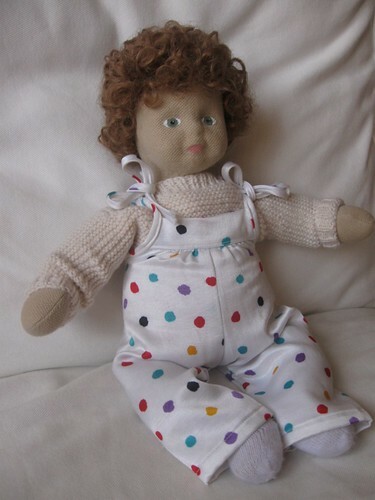 Especially when it comes to dolls. Here's Michael-- handmade down to his handknit sweater. His face is some kind of hard plaster form covered with fabric. Two francs later and Michael has come to live with us. The girls are already knitting him things. And then the marionette lion. 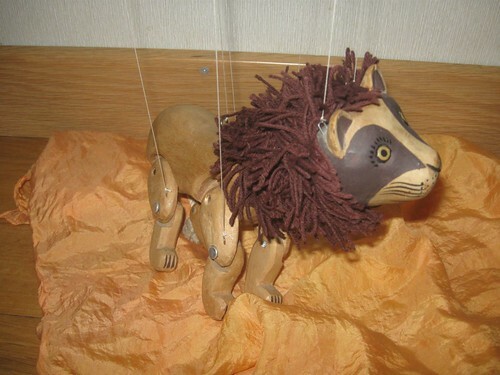 Can you say no to a hand-carved marionette lion? It's impossible, I tell you. 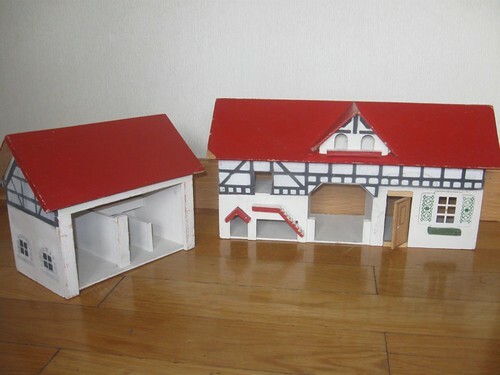 And dollhouses. They are a personal weakness of mine. And the kids know it. Moonshine spotted these little Swiss houses and immediately fell in love. Right next to these was another. 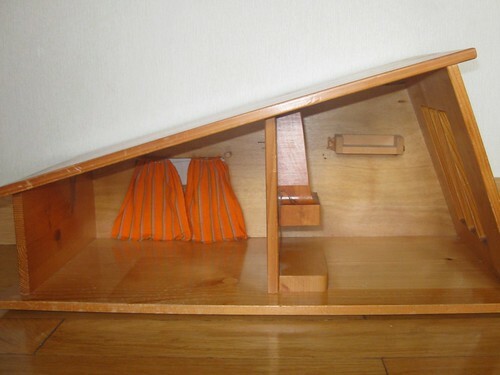 It had a built in stove and sweet little orange curtains. And her people moved right in... and they were so happy!! Moonshine has created a little village now. 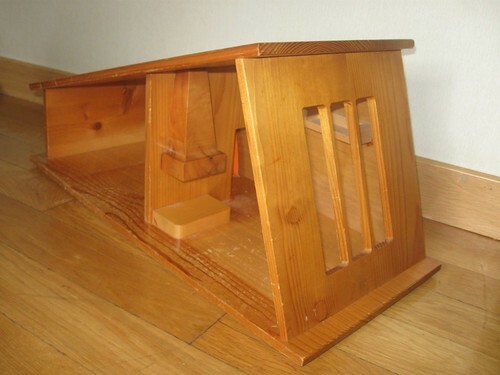 Most of the furniture has also come from another particularly fortuitous trip to the thrift store. I know it's crazy, isn't it? We keep trying to live with less stuff. And shop consciously, consume consciously. And reuse, recycle, and reduce. But sometimes those things just aren't synonymous. We're doing some of that... but it's hard to say no to this beautiful, unloved stuff. Amazing stuff that people made with their own hands, discarded. People do like to buy new here in Switzerland, so you can find anything-- even Waldorf toys, spinning wheels, and weaving looms-- at the thrift store. And all of it dirt cheap. I'm torn. I'm not sure how to feel about it, really. But I did manage to get plates. In case you were wondering. I suppose if nothing else, I did buy what I came for... and then some. Wooden plates at the thrift store.... sheesh! these are wonderful finds!!! I wish our thrift shop has such goodies! Enjoy them all! Wow, that is some good thrift finding. 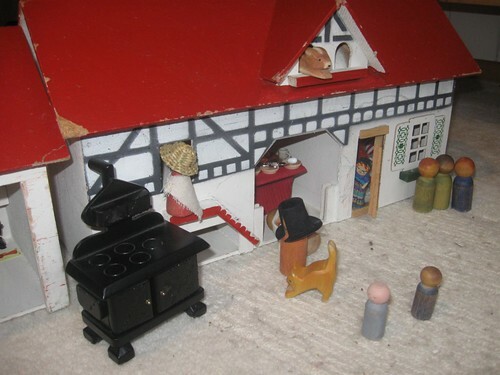 I love the little swiss houses, and that wood cookstove! My girls would be thrilled! what fantastic bargains! I can never find anything like this in the UK.... i think i need a little holiday out your way.... with an empty suitcase lol!!! And i could not have said no to the Lion either! Sooo very envious at your finds! 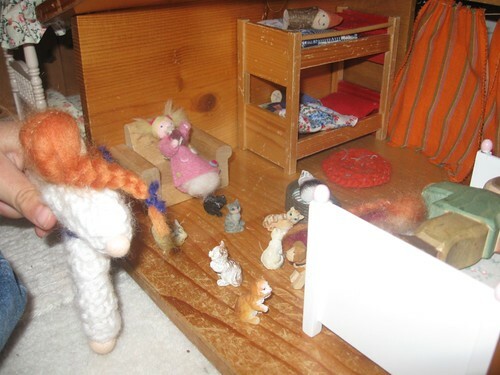 I often wish I had a little girl who loved dollhouses because they are also a weakness of mine. Whenever we went to the Children's Museum in Indy, I would stand for excessively long periods of time in front of the dollhouses. Dh thinks I have a sickness. ;D Looove thrift stores too! 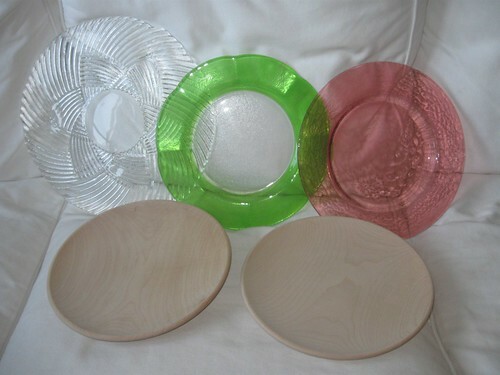 The dishes are cool too...are the green and pink depression glass? 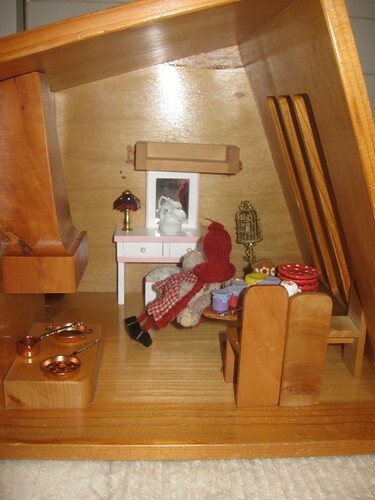 Teresa, there is a dollhouse museum here that is breath-taking. And no, not depression glass. Just pretty.